After three pre-season tours in a row to the United States, French glamor club Paris Saint-Germain turned to Asia in search of new fans and business deals ahead of the new season. It’s the market “with the biggest growth potential,” according to a PSG official. PSG’s Asian fan base has grown while its social media presence has exploded along with the French club’s rising profile. Riding the wave of rising popularity, the French club took advantage of the Asian tour to open a permanent office in Singapore. 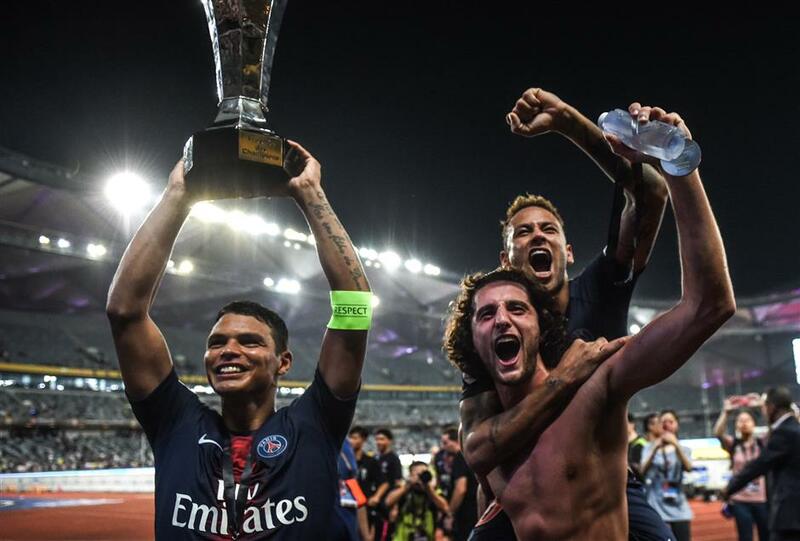 Paris Saint-Germain's Brazilian defender Thiago Silva (left), French midfielder Adrien Rabiot (center) and Brazilian forward Neymar celebrate with the trophy after winning the French Trophy of Champions football match between Monaco and Paris Saint-Germain on August 4, 2018 in Shenzhen. “With the growth the club has enjoyed in recent years, along with the arrival of our two superstars Neymar and Mbappe, we thought that now was a good time to do it, it was the right moment,” said Sebastien Wasels, the club’s Asia Pacific director. He said the Qatari-owned club with ambitions to dominate Europe needs the base to handle rising Asian growth opportunities. And the club that could face sanctions by European football’s governing body UEFA for allegedly violating regulations over spending limits needs to significantly boost its income. PSG says that it has signed several commercial deals in the region including a multi-million euro partnership with marketing agency Desports for sponsorship and licensing rights in China. The club has also pinpointed three geographical growth areas in Asia and plans to hire a team of five expert locals to focus on business development opportunities in China, South Korea/Japan and Southeast Asia/Oceania. During the club’s brief summer Asia stay that included matches in Singapore and the French Super Cup final against Monaco in Shenzhen, PSG hosted a range of promotional events. They included a cooking class by the club’s Brazilian defender Marquinhos and a training session for young players at China’s “PSG Academy” by former star player Maxwell, now part of the PSG management team. PSG’s eSports section was also brought into play to woo the younger generation, hosting a FIFA video tournament for 400,000 participants on local platforms to boost the club’s active gaming sector.